How many times have you had meals till you just can`t breathe any more? You eat and you don`t even know why. Maybe because you feel lonely or bored, or just because you can`t stop eating. 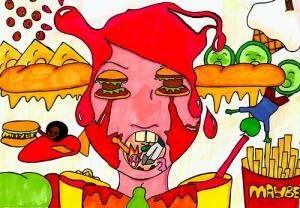 You eat at the fast food restaurants even though you know they can`t do you any good. You come home and you have a stomachache and you feel depressed. Suddenly your clothes becomes small and you notice that something has changed, but again you don`t know why. You need to find your center and your balance. Finding a reason of what is causing you to eat so much can save you a lot of further problems. Think about it. Ask yourself why you have to be so overpowered by the plate of some delicious meal. There are several examples of struggling with eating. You must have experienced buying much more food than you actually needed. You wanted to buy a friend some cupcakes, but you ended up buying a lot more than it was needed for the occasion. Eating the remainder by yourself is not such a bright idea, but you just cannot resist. They contain some ingredients that you have never heard of, but you don`t care as long as those cupcakes are so creamy and yummy. To solve this problem you need to control yourself regarding the amount of the food that you are buying. Buy just enough for the occasion and don`t let the food trick you again. There is one more example of people struggling with eating. There are people who work even when their working day has ended. They stay at work until 9 o`clock in the evening with having the last meal around noon. They are usually angrier with the work itself than with themselves and so they reward them with a big dinner at some fast food restaurant, having even more than they could actually eat. A couple of hamburgers had to be eaten with French fries and of course a big cup of some drink. The calories they ate that evening should be eaten by 3 - 4 persons. You should really restrain yourself from situations like this one. Go home and prepare yourself a nice, healthy dinner. And remember that you should eat regularly, so even if you have a really busy day, try to take a break for lunch. Another thing you can never let yourself become is the person who eats out of boredom. If you don`t feel like going out with your friends or going to see a movie, don`t stay at home and don't make a box of chocolate or ice-cram your best friend for the night. You must control your eating needs. Try to think of something fun to do. Don`t sit around waiting for something to happen. Make a plan of some interesting activities you would like to do. Think of some new, unexplored places you would like to visit. Go there, have fun there, just don`t think about the food anymore. Motivate yourself to become physically active and do your best to succeed in it.